The high quality folding shower benches and L-shaped seats are made of a stainless steel frame for strength and corrosion resistance. Rounded and smooth edges and hinges allow for a safe and easy side transfer. When properly installed, shower seats support loads exceeding the downward pull requirements for Federal specifications FHA, VA, HUD, hospital codes, and private construction. 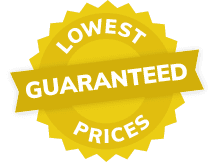 We recommend shower seats be installed using 2″ minimum thickness “in wall” solid wood backing material with #10 x 2″ stainless steel, phillips-head, sheet metal screws, or using a wall embedded, minimum 12 ga. (2.8mm) steel anchor plate with #10 x 24 stainless steel machine screws. Freedom ADA Shower seats are L shaped to suit most commercial or public shower requirements. All L shaped seats are wall mounted and fold up out of the way when not in use. The high quality shower seats are made in the USA, with a stainless steel frames. Various seat top styles are available to meet client preferences for durability and comfort. ADA seats with legs are available in a variety of styles and sizes including phenolic tops in white or teak look, or white padded seats with a waterproof naugahyde cover. Available in 26″, 28″, 32″, 34.5″, and 42” widths. Some seats are available with a reversible solid phenolic top. 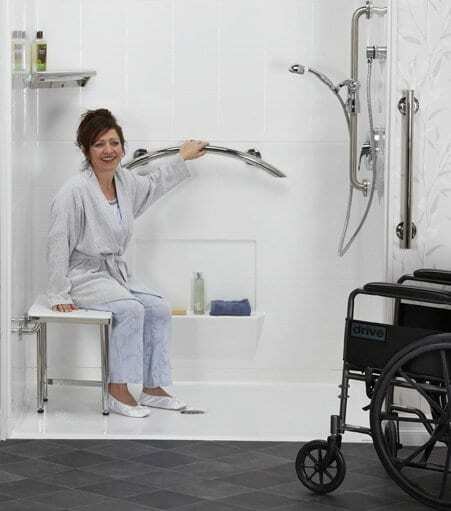 ADA shower seats meet and exceed the ADAAG guidelines when properly installed. Freedom shower seats with legs are tested with 900 lbs. of force and could be used for bariatric shower seats. Installing shower benches for elderly parents can make a world of difference in how comfortable and safe they feel taking a shower. You don’t always have the luxury to install a custom tiled shower with a built in bench, but adding a wall mounted shower seat that folds up out of the way when it’s not needs is a create alternative. Freedom Shower benches have a stainless steel frame and are available in a variety of styles and sizes to suit your preference. Seat top options include padded white naugahyde or phenolic white or teak slatted. Shower Seats with Legs are available in 18″, 22″, 24″, 28″, 30″, 32″ and 48″ seat widths. When properly installed, Freedom Shower Seats with Legs Support up to 900 lbs. of force. Wall supported Shower benches without legs are available in 18″, 22″, 24″, 28″, 30″, and 32″ seat widths and when properly installed will meet the ADA requirement of 250lb weight capacity. Most shower seats are designed to be installed with a seat height of 17”-19” to meet ADA requirements. Sometimes, a shower seat is needed for someone who is much taller or shorter and more options for installed seat heights. Series 4000 folding shower seats have two adjustable height legs that all the seat height to be set from 16” to 25” high. Made with stainless steel frame, legs and mounting bracket, the 4000 series shower seats have a 558lb weight capacity when properly installed. Adjustable feet allow for fine height adjustments also. Available in 18” or 23” widths, and in a bench style or U shaped commode style. Some people prefer extra support when in the shower and the Folding Shower Chairs with Back and Arms provide a more complete solution. They have the same quality stainless steel frame, legs and mounting brackets, a weight capacity of 558lb when properly wall mounted and adjustable feet to allow for fine height adjustments, like the benches. You can also install the chairs from 16” to 25” high. Available in 23” or 28” widths, and in a solid seat style or U shaped commode style, with either blue or gray pads.